Rina Ayuyang's obsession with Dancing with the Stars informs her new book. In Rina Ayuyang's childhood home in Pittsburgh, a distinct green carpet covered the living room floor, a space where Ayuyang and her older siblings would play and watch television. It's largely where the cartoonist's new graphic novel, Blame This on the Boogie, begins and ends — an ode to Ayuyang's childhood, where she found herself in song and dance. "That room is pretty much where I feel like my personality came from — the showmanship, but also like musical tastes, listening to music from the Hi-Fi that my parents listened to," said Ayuyang, who was nominated for Eisner and Ignatz Awards for her online comic, Beginning's End. Disco, pop, and threads of the unapologetic, ridiculous cheesiness of the '80s filled the room, and she fell in love with it all. It's the source of Ayuyang's lifelong obsession with musicals and dance, and what Blame This on the Boogie consistently centers on while telling the story of her life. The exuberant and delightful graphic memoir is Ayuyang's second book and traces her childhood in Pittsburgh to her eventual move to San Francisco and Oakland, where she's lived for the last 15 years. Along the way, she becomes an artist and mother, but all the while, the energy of the "boogie," whether in memories of watching Singin' in the Rain or in a perhaps unhealthy obsession with Dancing with the Stars, forms the thematic center of the book. "I really like how musicals, especially during the Great Depression, were an escape from hardships and a way to just forget about things," she said. "You can get away with a lot of things with musicals. There are no rules. They're as cheesy as you want to be. Stories don't have to make sense. You can just break out into song whenever you want." The freeform fantasies of the musicals played a similar role in Ayuyang's own life. The formative space of the living room, where she danced and consumed musical influences, is also where she felt safe growing up in Pittsburgh as a lonely Filipino American. "It goes back to the living room," Ayuyang said. "This was a refuge from school, from being bullied, from being different. That was sort of our place to be whoever you wanted to be. It was really like our playground for ourselves." A playground, though, where everyone is safe from the terrors of bullying and alienation that she chronicles throughout the novel. Yet, Blame this on the Boogie is relatively casual in its window into the childhood struggles of racism that are notably familiar for children of immigrants. They appear as unceremonious, if unfortunate, scenes of recollection, rather than weighty, pained memories. Instead, the warmth of her wonderfully chaotic household gleams the brightest from the page — a decidedly different rendition of the immigrant narrative. "I think it's great that we are seeing graphic novels covering the hardships of Filipino immigration and refugees, and to make that accessible through comics is amazing," said Ayuyang. But her story is different. There is struggle and isolation, but also the comfort of family, Fred Astaire and Ginger Rogers, the Pittsburgh Steelers, and, more than anything else throughout the book, Dancing with the Stars. "Someone said, this is actually really American. 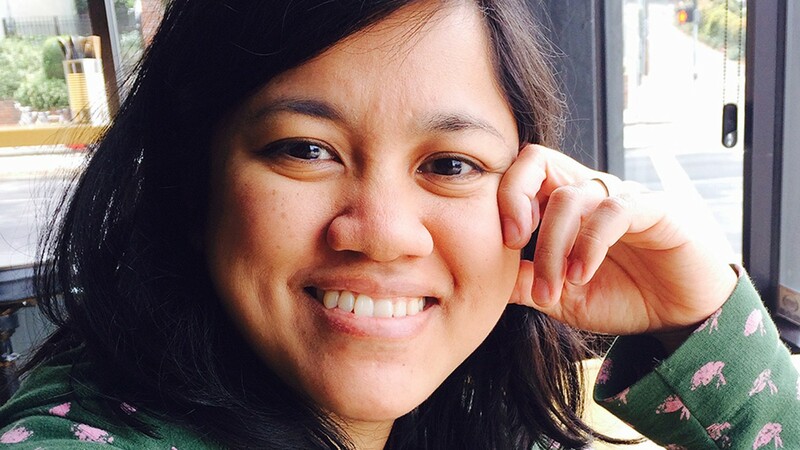 This is like the American Dream: Filipinos coming to the States and making a life for themselves and dealing with the struggles of fitting in and assimilating or adapting." This lightness with which Ayuyang handles more serious realities continues later on as the book extends into motherhood, and she quietly, almost imperceptibly, touches on postpartum depression. Meanwhile, music and dance remain center stage. A large portion of the difficulties and joys of motherhood are seen alongside her both shameless and shameful love of Dancing with the Stars, which served as a comfort through her struggles with postpartum depression. "So in a way, that cheesiness — of making a situation more lighthearted, an escape — was another example of where musicals and dance saved me in a way," Ayuyang said, amid detailed analyses of the show's arc through the years. Her lighthearted artistic and narrative approach is a reflection of that escapist love of song and dance. "I wanted to capture that feeling of happiness, joy, and being free and sort of showing the Technicolor look of what a musical looks like," she said. In her comics, pages are unbound by panels; scenes are formed by frames floating beside or colliding into one another. The drawings have the effect of spontaneous doodles — a style Ayuyang aimed for — brimming with energy and the vibrant shades of her colored pencils. The effect is a warm, inviting immersion into Ayuyang's world, one where quotidian struggles exist, but dance is comfort, and king. Join Ayuyang for a book release celebration Thursday, Dec. 13, 5-8 p.m., Bar 355, 355 19th St., Oakland.